Scottish-based retailer Thistle Help has recently celebrated a special anniversary, reaching the impressive milestone of 10 years in business. THIIS caught up Laura Hays, Business Development Manager, to find out how a five-minute chat resulted in a decade of retail success. 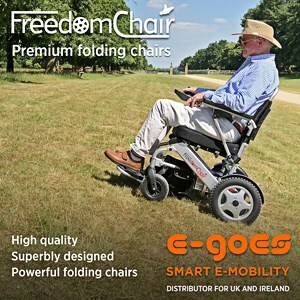 Founded in 2007 by George Ruddick and Laura Hays, Thistle Help provides a comprehensive range of specialist mobility and assisted living products for elderly and disabled customers. Starting life in a small shop, the company has gone from strength-to-strength in the last 10 years and currently operates from a spacious showroom in Irvine, Ayrshire on Scotland’s West Coast. Laura has been with the company from the very beginning and told us what inspired Thistle Help to form. “With George, our Managing Director, having Cerebral Palsy, he always required to use the services of other mobility dealers,” she explained. George originally had a print business which he ran for two decades before deciding in 2007 to wind down his print operations and diversify into the mobility market. “The idea behind Thistle Help initially came from a five-minute conversation between George and I. Before we knew it, we had a name, logo and premises!” added Laura. The retailer now sells a wide range of mobility products, including hoists, riser recliners, wheelchairs, mobility scooters, specialist seating and more, as well as offering hire and repair services. Interested to find out what the secret is to Thistle Help’s ongoing growth, Laura explained that the answer was really quite simple. “Our committed team of nine staff are the foundation of our success, as is our long list of suppliers providing us with the wide range of products in our showroom. Everything we do is centred around making our customers happy and ensuring they are satisfied with the service we provide,” said Laura. Thistle Help’s small but perfectly formed team has been a key element of the company’s growth, with many members of staff joining the Thistle family following participation in employability programmes. Gemma Cree, Assisted Living Advisor and also in the charge of Thistle’s accounts, joined in 2011 as a Modern Apprentice whilst the company’s Showroom Manager, Siobhan McKinnon, joined the organisation as a Skill Seeker in 2008 and has since become a key member of the management team. Another two members of staff joined through a council-led employability scheme, with both employees now playing pivotal roles in the retailer’s success story. For George and Laura, investing in their staff and making sure they have the opportunity to learn, grow and develop is the bedrock to ensuring the company is able to provide the service needed to keep customers smiling. Having accomplished so much over a decade of successful trading, including multiple awards, there are a variety of standout moments that the company can look back on with pride. For Laura, however, it was Thistle Help’s first contract win that she most fondly remembers. “One of the best experiences was when we were awarded our first contract with North Ayrshire Council to service and repair the ASN equipment for the local authority’s schools. We were so proud to have secured it as it was one of the first tenders we applied for,” she told us. The company has further diversified, providing servicing and maintenance contracts to nursing homes for their moving & handling equipment, as well as supplying to the general public, residential care and the local authority. Differentiating into new areas and winning contracts has proven invaluable to the retailer, however, Laura highlighted that this will also add more pressure to compete against larger suppliers vying for the same contracts. Laura also noted how the industry has changed over the years, with the consolidation of organisations being particularly prevalent. “Over the years, many of our suppliers have merged together, forming larger companies which are not always for the better,” she said. Looking ahead to the future, however, Thistle Help seems set to continue to expand, with plans of expanding the geographical presence and service portfolio in the pipeline. “We are looking at obtaining further premises in order to expand our servicing workshop and stock area, as our current showroom is no longer large enough to accommodate all our extensive range. With this in mind, we are hoping to attract more contracts due to having better facilities,” Laura explained. With ambitious plans on the horizon and a dedicated team at the helm, the future is certainly looking bright for Thistle Help.